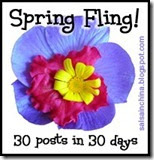 Well I almost made the 30 days but I had a oops day on Saturday and didn't get anything posted. I thought about cheating and back dating a post but then I thought "Really, I am going to cheat on myself" Who is really watching and nothing is going to happen to me if I skip a day. One of the things I realized during this challenge is that I don't like blogging daily. I think the requirement kind of took the fun out of it. However, I do think I should post a little more regularly. So I might start doing some weekly features like Sunday Snapshot or Fashion Friday or something fun. It was fun but I am ok with the spring fling being over, lets bring on summer! Thank you M3 for hosting the Spring Fling. What a special picture. Love it !!! That is a perfect Spring picture of Chloe with the flowers behind her !! that was from Aunt Carol love you all!! It's hard to keep up like that. Sometimes I just send a photo straight from my phone to the blog! I didn't even notice the missing day, but I did enjoy following the (almost) daily news and pictures. I hope you'll find the energy to continue blogging, whether it is daily or weekly or monthly. You have a beautiful daughter and I think it will be nice for her to read and look at when she grows older. Love the picture, let the summer begin soon!